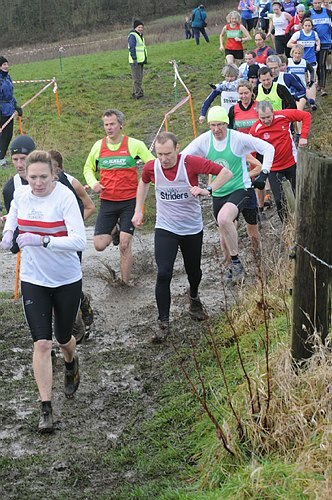 Ilkley Harriers were pleased to welcome you to the third race in the PECO XC League 2009/2010! This event included the Junior XC Challenge Races for girls and boys aged 8-16 on the day. Well, the snow melted, the sun almost shone, and the 'stream crossing' although higher than in 2008 was lower than the day before! Thanks to Neil and Shirley for organising, to the famous Ilkley Ladies Catering Team who fed the 300, to the many, many marshals and helpers on the day. And a big thank you to the Nell Bank Centre whose fantastic facilities we enjoyed and to Mr Boothman whose fields we enjoyed. There is no parking for competitors at Nell Bank - there is public car parking at Ilkley Swimming Pool 10 minutes walk away. If you park on Denton Road please take great care. Please note that Nell Bank is a dog free zone. Please do not bring your dog. The Google Map can be used to get travel directions. On farm fields. The going can be 'heavy'. Studded shoes or spikes recommended. Update 9 Jan: Google Maps senior course updated to avoid some rutted areas. Gateways will be frozen/rutted or muddy, be prepared! Senior Course 5 miles Google Map. 1 lap of small first field then 3 large laps, clockwise. See Google Map for site layout. www.abbeyrunners.co.uk/PECO/peco.html for all League details, results, League tables, etc.